mobile phone to your hearing aids. One of the hardest things about hearing loss can be talking on the phone. Missed words and misunderstandings are frustrating on both ends of the line. The ReSound Phone Clip+ lets you stream phone calls and audio straight to your hearing aids from any Bluetooth-enabled mobile phone or smartphone. So you – and the person you’re talking to – can enjoy comfortable conversations, even if one of you is located in a noisy environment. ReSound Phone Clip+ provides a hands free experience for your Bluetooth-enabled phone and can easily be clipped directly onto your clothes. ReSound Phone Clip+ also allows your Smart Hearing aids to connect to two separate Bluetooth devices at the same time. This makes it easy to stay connected, for example, to your Bluetooth-enabled private and work phones simultaneously. When the ReSound Phone Clip+ is used in conjunction with the ReSound TV Streamer 2, your phone's ringtone will override the audio streamed from the TV and allow you to decide whether to answer or reject a phone call. 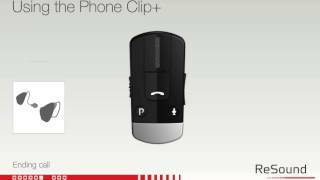 The ReSound Phone Clip+ for Android is easy to set up and use. The ReSound Phone Clip+ is one piece in the full ReSound Ecosystem of accessories and apps which enhance your ReSound Smart Hearing experience. 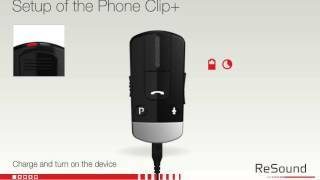 The ReSound Control app and Phone Clip+ turn your Android smart phone into a remote control for your Smart Hearing aids, phone and streaming accessories. This discreet control allows you to adjust your Smart Hearing aid’s volume and program settings - right from your phone. Your hearing care professional can help you find the best hearing solutions for your needs.